The 29.9 metre sailing yacht Windcrest, listed for sale at Burgess, has been sold in an in-house deal within five months of coming on the market. Designed by Ted Fontaine, she was built in epoxied cold-molded wood by USA yard Hodgdon Yachts to ABS class and delivered in 2006 as an all-American single screw ketch with a superstructure repaint in 2009 and regular maintenance since. An interior in raised panel walnut accommodates up to eight guests in three cabins consisting of a master suite and two twins, plus two Pullman pipe berths, all with en-suite shower facilities. There are also two twin cabins for four crew. The large deck saloon has comfortable seating, a sophisticated navigation system and a casual bar sheltered beneath an awning, while in the saloon proper is a formal dining area for six guests and a state of the art entertainment centre including a large screen Toshiba television and a Sony DVD system. On the technical side, Windcrest has a full wardrobe of North Sails, Reckman furling gear and Lewmar hydraulically operated winches. An adjustable swing centreboard draws only 2.4 metres with the board up, making all those enchanting small bays and anchorages accessible. 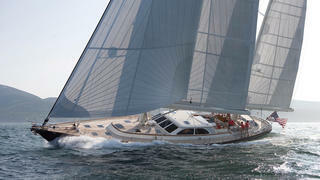 Under power, a 300hp Lugger diesel enables a range of 1,400 nautical miles at her cruising speed of nine knots. Notably, this sale marks the 11th sailing yacht Burgess has sold in the last 18 months, with an average length of 40.13m (131.6ft).